Speaking about the find, Dr. Kuridze said: "Everything that happens in the sun's outer atmosphere is dominated by the magnetic field, but we have very few measurements of its strength and spatial characteristics. "These are critical parameters, the most important for the physics of the solar corona. It is a little like trying to understand the Earth's climate without being able to measure its temperature at various geographical locations. "This is the first time we have been able to measure accurately the magnetic field of the coronal loops, the building blocks of the sun's magnetic corona, which such a level of accuracy." Measuring 1,400,000 kilometres across (109 times larger than Earth) and 150,000,000 kilometres from Earth, the sun's corona extends millions of kilometres above the surface. Until now, successful measurement of the magnetic field has been hindered by the weakness of the signal from the sun's atmosphere that reaches Earth and caries information about the magnetic field, and limitations in the instrumentation available. 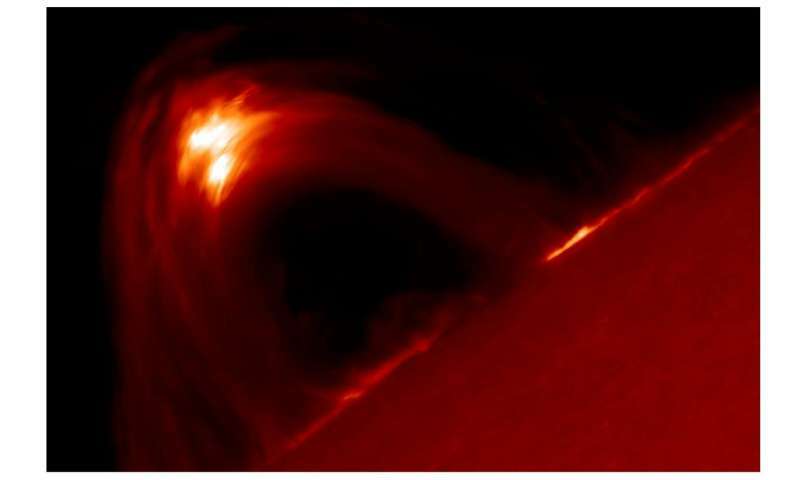 However, they are still responsible for the confinement of the solar plasma, which make up solar flares, as far as 20,000 km above the sun's surface. Over a 10-day period in September 2017, Dr. Kuridze studied an active area on the sun's surface which the team knew to be particularly volatile. However, the telescope used can only focus on 1% of the sun's surface at any given time. As luck would have it, Dr. Kuridze was focused on exactly the right area and at the right time when the solar flare erupted. These solar flares can lead to storms which, if they hit Earth, form the northern lights – the Aurora Borealis. They can also disrupt communications satellites and GPS systems, as proved to be the case on this occasion in September 2017. Professor Michail Mathioudakis from the School of Mathematics and Physics, Queen's University Belfast, who also worked on the project, added: "This is a unique set of observations that, for the first time, provide a detailed map of the magnetic field in coronal loops. "This highly rewarding result was achieved due to the dedication and perseverance of our early career scientists who planned and executed the observations. The methodology used in this work and the result itself, will open new avenues in the study of the solar corona." Gad zooks! This is off by an "order of magnitude", as my co-poster DS would say. One wonders if sun screen needs to get goosed to cover a proton storm at the beach! The reported 9/2017 flare happened within a month after the Nobel 'proven' Gravitational Wave (GW) event of NS merger. LIGO/VIRGO triangulated the source direction toward Sun and it could be associated with GammaRayBurst (GRB) that soon disappeared behind the occluding Sun in foreground. This 'visible confirmation of GW proving Einstein right' convinced the Nobel committee decision in few weeks (vs typical decades of repeated proofs) despite the fire storm of protesters who had found flaws and obvious evidence (precursor and echo correlations) in the theoretical physics foundations of Dynamic Universe (unified GR/QM theory) and flaws in system engineering concepts of LIGO/VIRGO to explain GW. Yes, we are living at exciting times when the local Earth/Sun centered views/proofs must to be extended to more cosmic thinking and technologies. Not even in the ball park! Looks more to me like "Researchers Find the Sun's Magnetic Field is Ten Times Stronger Than Previously Believed in Certain Areas in the Corona." @dfjohsonphd yes I wondered about the '10 times greater' part myself. It does seem unlikely that previous measurements would differ by that much. And as you point out, raises questions about other issues. However, just wondering if there were very large variations at the Sun's active periods if such might help in partly explaining why the Sun's corona is a great deal hotter than below it? As I understand it, currently scientists think this is due magnetic dynamics in the lower regions. But perhaps this might then mean this order of magnitude occurs often, if not continuously, suggesting that earlier measurements would probably have found it. Hmm, yes unlikely eh? @Mimath224, it may simply be the closeness of the sun which allows these people to study details impossible in more distant objects. A flood of solar data, from temperature, mag fields, corona, sun spots etc. could easily cloud interpretations when trying to take it all in. Maybe we need to cut them some slack since we are not experts on this by any means. Something tells me solar physics is non-trivial. well abboyingmousuie, I suppose you could link akk these varities of phenomena to a single, coordinated event? However, the GW & CR woyld have to been traveling at superluninal speeds. As well as travelling backwards in Time to sgow up here before they evem left their points od origin. & tour evidence for this "phenomenal" occurrence? Are you aware that your spelt words are terrifyingly incorrect? Either there is something drastically wrong with your keyboard, or you are now all thumbs. Do try to be neater and more accurate in your typewritten wording, yes? And lay off the spiked punch. All of this (practically) should boil down to predicting "solar weather" to help protect space assets, and even "life assets". If this 10-fold increase ends up being correct, it has to change the thinking on the potential for estimating size or even timing of CMEs and high intensity proton storms that are capable of reaching the surface and causing extinction events, or I have read. Anybody with any knowledge of this, please respond. Don't trust that old sun as much I used to after reading this, and about proton storms. The strange coincidence of DU predicted deceleration rate of dC/C= -3.6 10^11/yr equals -1.15 10^-21/ms. The very first time LIGO reached this 'strain resolution' limit in 2015 it found the 'proof' of BH merger at few B l.y distance after decades of failed attempts. This dC/C limit is also the frequency change of physical atomic clocks that compensates the deceleration of TRUE value of C - so in local Earth energy frame C is observed constant, fooling not only Einstein GR but also QM foundation of Planck energy equation. So, after LIGO removed the scale change pull of gravitational energy of all cosmic mass objects in its TWO perpendicular vacuum tubes in 3-D space, even tiny disturbances from Sun or other local sources can explain the found 'GW disturbances'. See also my past explanations about GW and other DU features. And rrMousie do not choke in gulping JD C charmy yoghoord! @Castrogiovanni, how we be sure? We don't even know what this freakin' alien is talking about. Maybe it is some kind of anti-transmission from a parallel universe....or a Tralfamadorian. Sounds reasonable to me though I think your last sentence is a bit of an understatement (joking ha!) Will be interesting to hear results from the Parker solar probe, a real ambitious step in technology. The engineers at this 'cutting edge' deserve much praise. Actually, a really BIG CME hasn't occurred that affected the Earth in over a billion years. Not saying that it couldn't happen now - but it is highly unlikely to happen in your lifetime. Have you ever seen the Nicholas Cage movie, "Knowing"? All of this (practically) should boil down to predicting "solar weather", and about proton storms. The plasma ignoramuses seem confused, but this is not surprising given their misunderstanding of how these fields are created. The observed magnitude stronger magnetic fields were created by the electric currents flowing through the coronal loops, the magnetic fields weren't carried there from the solar interior. The fundamental misgivings about how magnetic fields are created in plasma leads to these unexpected observations. Hopefully, one day these plasma ignoramuses will get a clue. Hopefully, one day these plasma ignoramuses will get a clue. Yes CD, we do indeed hope that one day you do. The observed magnitude stronger magnetic fields were created by the electric currents flowing through the coronal loops, the magnetic fields weren't carried there from the solar interior. So the electric current comes out of nowhere? You say it doesn't come from anywhere since it doesn't come from the Sun's interior. As usual you make no sense. Hopefully one day you'll get a modicum of understanding of plasma physics before commenting. As usual, you are talking crap. The Carrington event was 1 billion years before Carrington? I think not. The Carrington Event was a major CME back in 1859. Losses today from such a powerful event to satellites, power grids, etc, is estimated around $2 trillion (high end). I have read about a solar proton event (SPE) that may have caused a small-scale extinction near the end of the last glacial period. No other explanation has been found, and a strong increase in local C14 is associated with this event. A strong SPE that reached the surface might ruin your day. Anybody out there who is rational seen any data like this? It could be mistaken. We have not been around long enough with sophisticated instruments to know what the sun is capable of. Most hyper-intense SPEs in the historical "record" would have been written off to some deity or the devil, or some such rubbish, or may even not appear in any records. So the electric current comes out of nowhere? You say it doesn't come from anywhere since it doesn't come from the Sun's interior. As usual you make no sense.